Great hosts! Feels like home, great location and magnificent balcony view! The balcony with view of Mont Blanc; superb way to spend twilight, and watch the alpenglow on the peaks. The trees across from our apartment filled with birds at evening, and they greeted morning with song as well. Stations for Aguille du Midi and glacier trips very conveniently nearby, as well as bus station. Very nice place and superb location in the centre of Chamonix. Very easy-going hosts, allowed us to delay check-out to fit in with our airport transfer. 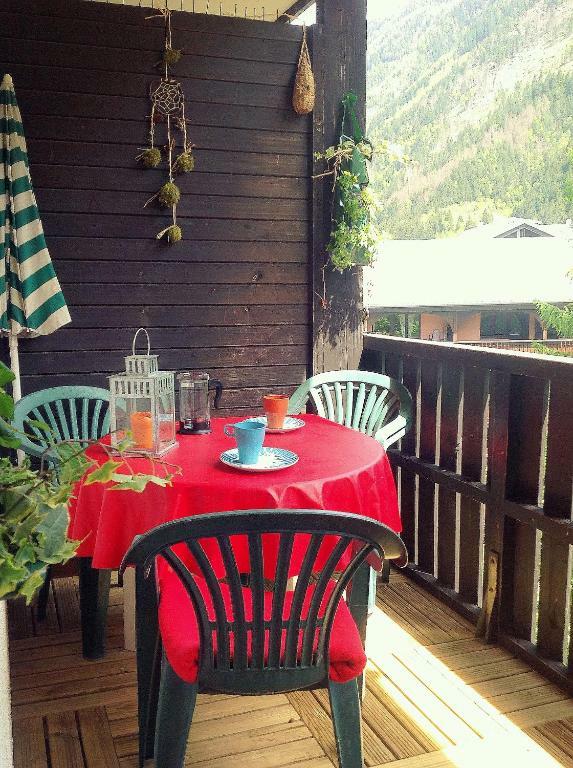 Comfortable (at least for two), warm apartment, conveniently located in Chamonix Sud near the ski-bus stop and a few minutes walk from the centre of town. No noticeable noise from outside or other apartments, so slept very well. Ski locker in basement of building and a parking space in the underground garage (which we didn't need). Great hosts awesome location great views from the deck . close to restaurants and bus stop outside front door . 15 minute walk from train station. Apartment is comfortable clean and good value for money. While basic and worn,it was functional,in a good location with excellent views. Well located, clean, indoor parking, perfect for a.ski holiday for a family. 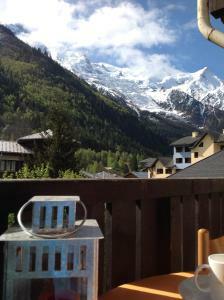 Lock in a great price for Appartement Grépon Mont-Blanc – rated 8.8 by recent guests! One of our top picks in Chamonix.Appartement Grépon Mont-Blanc is a self-catering accommodations located in Chamonix-Mont-Blanc. The property is 2,300 feet from Chamonix - Planpraz Ski Elevator and 150 feet from the Aiguille du Midi cable car. This apartment will provide you with a TV, a balcony and a seating area. There is a full a kitchenette with a dishwasher and a refrigerator. The private bathroom comes with a bath and a toilet. Guests can enjoy views of the Mont-Blanc from the rooms. Other facilities like ski storage are offered. Activities in the surrounding area include skiing and golfing. Chamonix Golf Club is 2.5 mi away. The property offers free parking. If you feel like visiting the surroundings, check out Montenvers - Mer de Glace Train Station (0.7 mi) and Glacier des Bossons (5.6 mi). 뀐 Located in the top-rated area in Chamonix, this property has an excellent location score of 9.8! 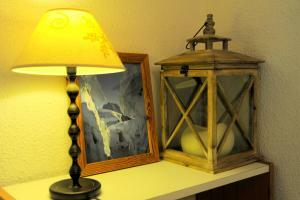 When would you like to stay at Appartement Grépon Mont-Blanc? This apartment features a electric kettle, seating area and oven. The apartment is located at the last floor of the residence. The balcony offers a great view of the Mont Blanc. You will enjoy all the avantages of staying at the city center with all the calm of the last floor. Ski patroler in the ski area and part of the mountain rescue team, I am very pleased to welcome people in Chamonix and to share my passion with them. Village de Chamonix Sud or "Cham' Sud" for locals is just a step away from the city center. There is the meeting point for alpinists and riders at the bottom of the cable car of Aiguille du Midi (3842m). You will find all the facilities in this quarter (Restaurants, Shops, Boulangerie, Super market, Main Bus station, Train stop, Cable car...ect) The proper center of Chamonix is 150 yards walking. House Rules Appartement Grépon Mont-Blanc takes special requests – add in the next step! Please note that prepayment is due by credit card, bank transfer or check. The property will contact you directly to organize this. Please note that bed linen is not provided. Bed linen and towel rental is available at the property for a EUR 10 extra fee per person per stay. Please inform Appartement Grépon Mont-Blanc of your expected arrival time in advance. You can use the Special Requests box when booking, or contact the property directly using the contact details in your confirmation. The plug in bathroom hanging of wall. The apartment was functional but basic. For a 100 euro per night very expensive for what you got. The hosts very good with queries. Minor and just one of those things - one of our hosts had an incorrect mobile number for me so the initial checking in was complicated. However, they went to great lengths to get in touch (assuming I was out of battery or not answering), so really a testament to how helpful they were. The interior side of the building is old and needs to be refurbished. Especially the carpet in the corridor of each floor. The sink and bath of the apartment need to be refurbished. The balcony was not entirely accessible as describe in the photo. A storage space on the floor was occupying 1/4 of the surface. The view of the Mont Blanc. Easy access to all areas, location was first class and the host extremely pleasant and helpful even on the lead up to the trip. Thank you very much, highly recommend and would use again. Hot upstairs needs a fan to cool but fine to sleep downstairs. It is a bit worn so an update here and there would make the apartment great. Description requires updating for clarity, especially regarding cleaning obligations and linen costs. Friendly owners, met outside the building on arrival. Excellent value and a great location. Underground parking perfect in very snowy conditions. Very nice use of space, lots of beds but still room for livingspace! Great location in Chamonix with ski busses around the corner, and still just a short walk to the center of the village.